Ned wakes up all groggy to find the King and Queen by his bedside. He tries to deflect the blame for Tyrion's capture away from his wife and onto himself. Cersei is hell-bent on vengeance, though, and Robert slaps her when she won't back down. After she storms out of the room, Robert admits he shouldn't have done it. He wants Tyrion released, but Ned demands to know what's going to be done about Jaime, who's fled King's Landing, and the Stark guards who were killed by him and his men. Robert's hands are tied because as much as he may want to punish Jaime, the Crown owes Tywin Lannister a ton of money. Robert, not one to really focus on his problems himself, announces that he's going hunting and Ned is to sit the throne in his absence. Daenerys gets the simply brilliant idea to put one of her dragon eggs in the fire. Irri catches her in the act and rushes to help, burning her hands in the process. When the handmaiden checks Daenerys's hands, however, there's not a single burn on them. Bran's new saddle is ready, and he's out riding, accompanied on foot by Robb and Theon. While the latter two are talking, Bran rides out of their sight and is set upon by some Wildlings, including Osha. Things look mighty grim for both Starks until Theon launches a perfectly aimed arrow right through the Wildling holding a blade to Bran's throat. A sleeping Tyrion wakes up just in time to prevent himself from rolling off the edge of the sky cell and into the abyss below. Arya doesn't want to practice sword fighting because she's upset over what's happened to her father and poor Jory. Arya, you need to keep "dancing;" it's an invaluable skill that's about to come in handy. Repeatedly. In Vaes Dothrak, Daenerys has to eat a horse heart. Lovely. Her son is pronounced to be the most awesomest kid ever, making Drogo a proud dad-to-be. While this is going on, Jorah catches Viserys attempting to steal the dragon eggs. What a loser. Jorah "persuades" Viserys to drop the eggs. At the Eyrie, Tyrion claims he wants to fess up, but once he starts, it quickly becomes a farce. He's not joking, however, when he demands a trial. Lysa warns him that if he's found guilty, his life will be forfeit. There's no executioner at the Eyrie; the guilty are just shoved out the Moon Door, much to the apparent delight of young Robin Arryn. Tyrion demands trial by combat, which at first draws guffaws from the assembled onlookers, until Tyrion further adds that he wants Jaime as his champion. His proposal backfires when Lysa declares that the trial will take place the same day. Just when it looks like no one will fight for him against Ser Vardis Egen of the Vale, Bronn steps in. The hunting party consists of Robert, Renly, Ser Barristan, and Lancel Lannister. 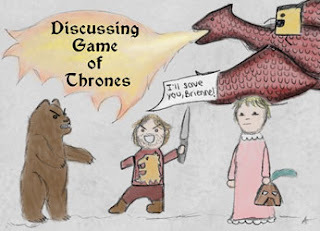 Note how Lancel keeps trying to offer the King wine . . . .
Ned is sitting the Iron Throne and listening to petitioners. One man describes trouble in the Riverlands, which, not coincidentally, Catelyn once called home. The culprit is identified as Ser Gregor Clegane, the Mountain, and Ned dispatches Lord Beric Dondarrion to deal with him. Ned further orders that Tywin Lannister be summoned to Court to answer for Clegane's crimes. Bronn looks pretty shabby compared to Ser Vardis, all decked out in his knightly armor. It's the heavy armor that proves to be a hindrance to the knight, however, and Bronn, not being a knight, does what needs to be done to win. So Ser Vardis gets sent out the Moon Door, and an outraged Lysa cries that Bronn fights without honor. Bronn's dry response is that Ser Vardis did. And that's why I love Bronn. Sansa is acting pretty bitchy with Septa Mordane when Joffrey struts in with a necklace as a makeup gift. So her dreams of being Queen someday are back on. Just as Sansa is all happy that Joffrey is seemingly happy with her again, Ned tells the girls that they're being sent back to Winterfell for their safety. Sansa whines about loving Joffrey, and it's her remark about blond hair that finally sets off a light bulb in Ned's head —the Baratheons all have black hair. How in seven hells is Joffrey blond? An inebriated Viserys goes looking for trouble—with a sword that's forbidden in Vaes Dothrak, where no weapons are allowed. And he gets trouble. Khal Drogo, having had enough of Viserys's crap even if he is Daenerys's brother, promises Viserys his crown—in the form of a pot of hot, molten gold dumped on his head. Goodbye, Viserys; we won't be missing you. I loved this episode. Especially when Viserys was crowned. Gruesome as it was, he was such a jackass I do believe he deserved what he got. His death was really a type of poetic justice. If he had half a brain he would have understood he couldn't go around all willy nilly and addressing the Khal the way he did. The Dothraki wasn't having that. Nice recap! I had no sympathy for Viserys, either. He was deranged and cruel and would have made a horrible king (not that Joffrey was any better, lol).